Homemade Grilled Keto Cheese Burgers on Portobello Buns fit into your low-carb, high-fat diet. Made with lean ground beef, cheddar cheese, bacon, avocado and portobello mushrooms. This Grilled Keto Cheese Burgers recipe is sponsored by Black Creek but the content and opinions expressed here are my own. Cheese burgers have always a favorite of mine, especially when they’re grilled. I’m talking about fancy restaurant burgers or homemade. This is important because you know exactly what ingredients are going in them and can control the quality, and therefore flavor. These Grilled Keto Cheese Burgers are loaded with flavor thanks to clean, quality ingredients. 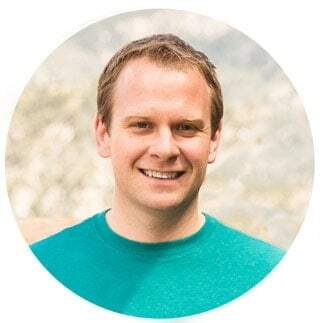 If you’re not familiar with a keto diet, it basically consists of a moderate amount of protein, very limited complex carbs and plenty of healthy dietary fat. In theory this makes your body burn fat, since that’s its primary source of fuel, instead of sugar or glucose. While I’m not limited to any particular diet, this sure isn’t a bad way to eat. Ground beef, cheddar cheese, bacon, avocado and veggies, yes please. It’s a bomb of flavor and totally a keto cheese burger. To make these burgers keto, I used portobello mushrooms as the bun. You may have heard of portobello burgers as a vegetarian option, but these are reversed. With minimal ingredients, quality is key for flavor and health in these Grilled Keto Cheese Burgers. When possible, use grass-fed and/or organic ingredients. For the cheese I used award-winning Black Creek® premium Cheddar cheese, specifically their Extra Sharp Aged 2 Years. Their cheeses start in Wisconsin’s Fox River Valley, an area known for its picturesque pastureland. The region’s cows graze on nutrient-rich grasses, creating distinctly rich and creamy milk. The milk is then cultivated into smooth, full-flavored Cheddar with a flavor profile that is both rich and nutty. 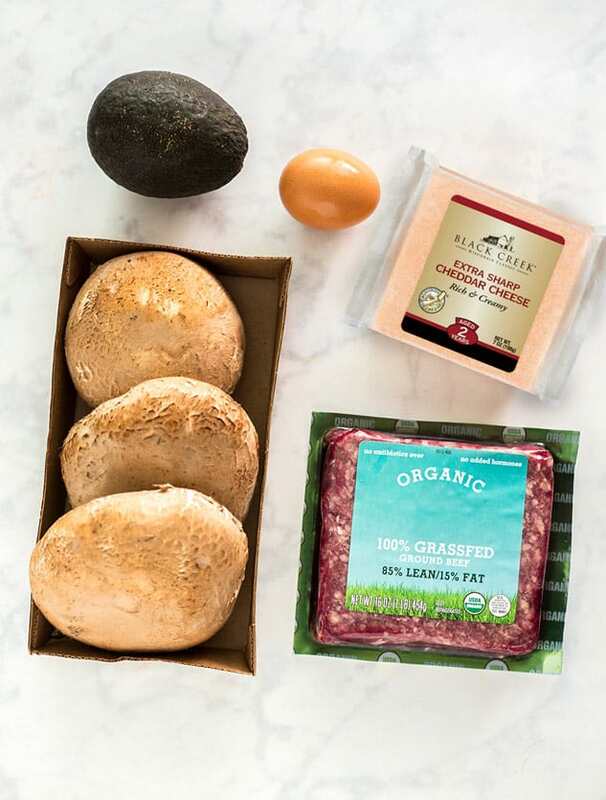 These Grilled Keto Cheese Burgers also include organic ingredients such as lean grass-fed beef, hormone/nitrate-free bacon and egg, as well as avocado and portobello mushrooms. 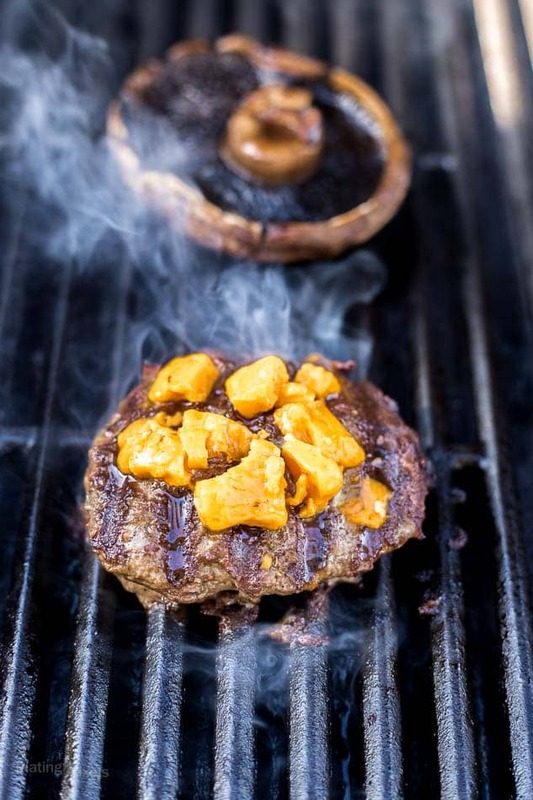 Grilling season is always better with cheddar and keto burgers loaded with delicious flavor. These Grilled Keto Cheese Burgers fit into your low-carb, high-fat diet. With lean ground beef, bacon, cheddar cheese, bacon, avocado and portobello mushrooms. Let ground beef sit at room temp 20-30 minutes. Preheat gas grill to medium-high heat or prepare coals if using charcoal. Cook bacon in non-stick pan over medium-high heat until crisp, 2-3 minutes per side. Drain and set aside. Alternately you can cook them on grill with burgers. In a medium bowl mix together ground beef, egg, worcestershire sauce, garlic powder, salt and pepper. Form into 3 patties, about ¾-inch thick. Place burger patties and mushrooms on lightly greased grill and cook 4-6 minutes, until sear marks form on bottom. Reduce heat to medium and flip items. Cook about 5 minutes longer or until seared, mushrooms are tender and burgers reach and internal temp of about 150° F for medium. Top each burger with desired amount of cheddar right before end of cooking and melt. 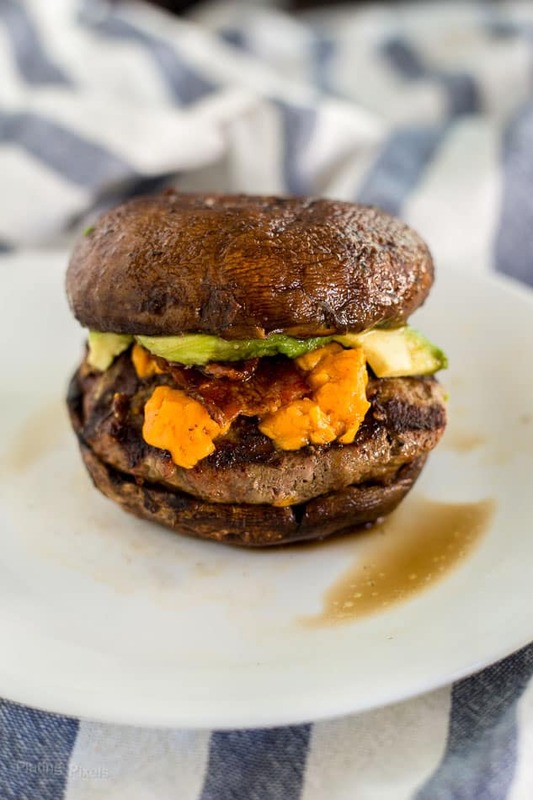 Place burger patties on mushrooms and top with avocado and cooked bacon. Note: Makes 3 open face burgers. Cook 6 thin portobello mushrooms if you want for both sides. What a great idea to use portobello mushrooms, this looks so delicious! What a wonderful idea making “buns” out out of portabello mushrooms! 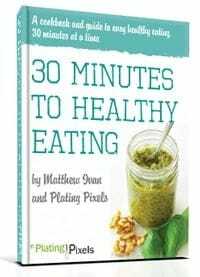 I try to consume a really limited amount of carbs, and this is absolutely genius idea! I love the idea of a portablello bun! I often swap out a bun for lettuce but this is a great new way to try a healthier burger! Holy cow you have me craving a big juicy burger right now! 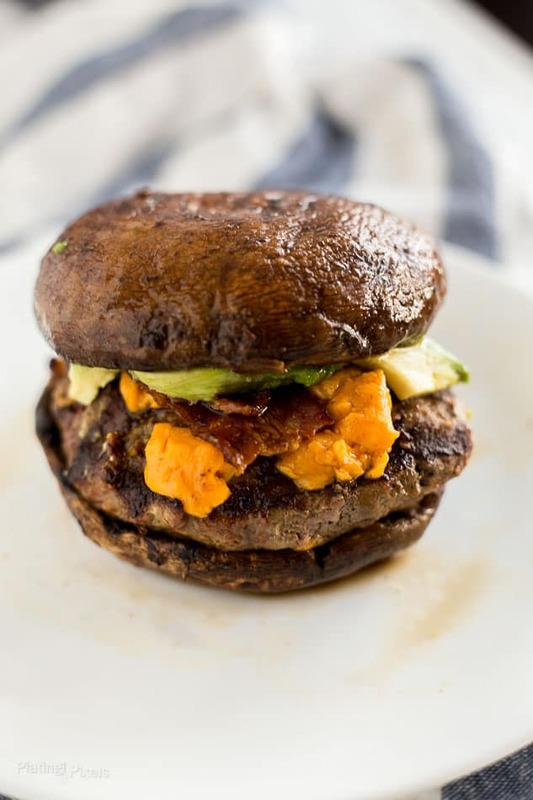 Gotta love a big ole Portbella mushroom on the grill and topped with a beef patty with melted cheese and avocado! YUM! Matt, this looks absolutely scrumptious! I’ve had portobello burgers before, but never used it as the bun. What a great idea! I love that bacon, avocado combo, too!